In every country, country folk imagine that they have the corner on national traditions. 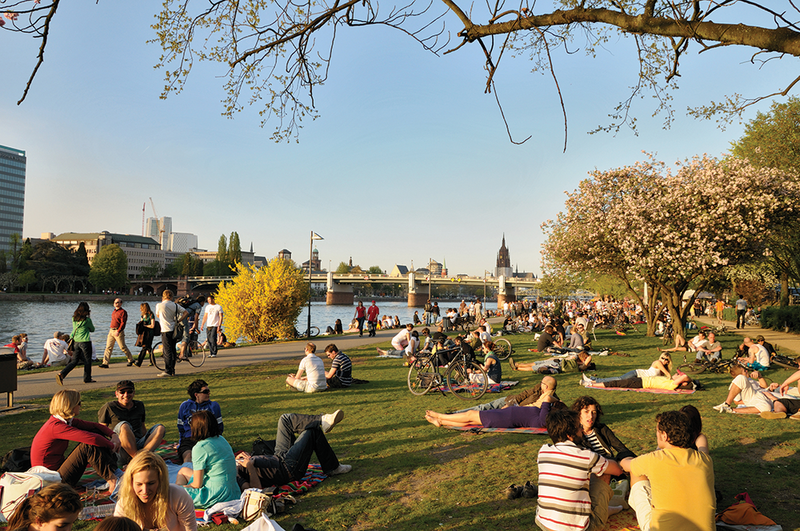 In 2015, the German National Tourism Office will turn to traditional Germany as a promotional platform, hoping to get visitors out to the countryside, but there’s nothing more traditional than certain neighborhoods in the country’s most modern city, Frankfurt. While first impressions of the city on the Main are dominated by its towering modernist skyline, seemingly more American than German, the roots are as traditionally German as anywhere in the country. The giant Euro Sculpture in front of the European Central Bank proudly proclaims the city’s role as a European leader, but Frankfurt nurtures a very traditional soul. Frankfurt grew outward from a Roman camp located where the legions could ford the river and suppress the local tribe of Franks. The city’s Römerberg Square grew out of that encampment to be what it is today, the center of the Old Town; a square lined with half-timbered buildings and highlighted by a city hall more than 600 years old. The nearby Kaiserdom (Emperor’s Cathedral) was an official site for the election of kings and the coronations of Holy Roman Emperors between 1239 and 1356. During the Middle Ages, it served as the official seat of the imperial chapter of St. Bartholomew. Today, the “electoral chapel” remains a place of prayer and silent contemplation. In 1848, the Paulkirche hosted Germany’s first National Assembly. So you can see that Frankfurt has been central in the structure of European power and finance for centuries going back to Charlemagne and beyond. PHOTO: Wandering the promenade along the Main River offers easy access to the Museum Embankment and is a pleasure in itself. The Museum Embankment is home to 26 museums evenly divided between locations on or near the Main River. On a nice day, it’s a real pleasure to walk the promenade that runs alongside the river with a Frankfurt Card in your pocket to help you explore all those museums. In late August the annual Museum Embankment Festival, attracts about 3 million visitors to its mixture of arts, music and cuisine. The Städel Art Institute features works from the 13th to 20th centuries including works by such old masters as Dürer, Rembrandt and Botticelli. Frankfurt’s Museum of Modern Art contrasts nicely to the Städel with a collection that includes Roy Lichtenstein, Andy Warhol, Frank Stella and Joseph Beuys. More than 20 performance arts venues operate in Frankfurt today. Theater is especially thriving with some 30 different theatre groups performing in the city. Frankfurt’s English Theatre is the largest English-language theater in Europe. Johann Wolfgang von Goethe was born in Frankfurt and the Goethe House and Goethe Museum present a reconstruction of the 18th-century, middle-class home he was born in. A two-hour walking tour follows his footsteps and is led by a guide in traditional costume. One of the city’s most signature bits of architecture is a shopping mall. The MyZeil mall designed by Massimiliano Fuksas features what looks like a whirlpool of glass in its roof that literally floods the building with light. The mall is located on the “Zeil”, a newly renovated walkers-only zone where the city hangs out. The most exclusive shopping street is Goethestraße where designer fare is the norm. 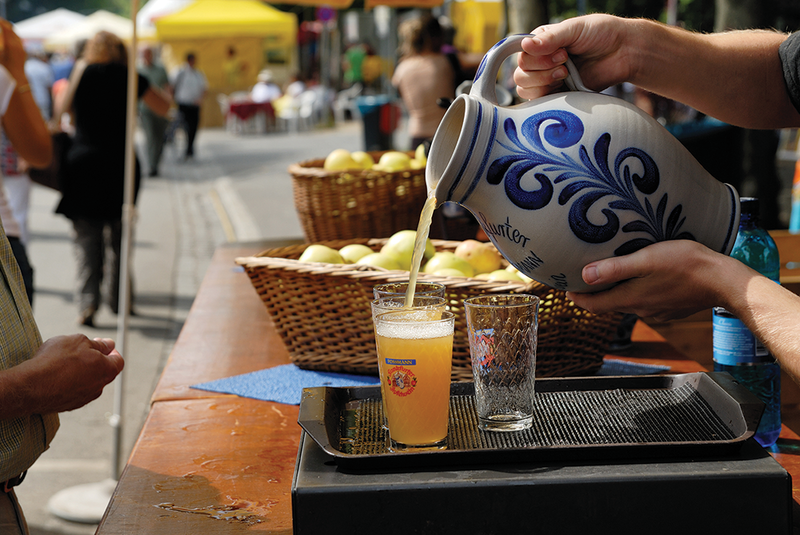 PHOTO: They’ve been drinking Apple Wine in Frankfurt since the days of Charlemagne. 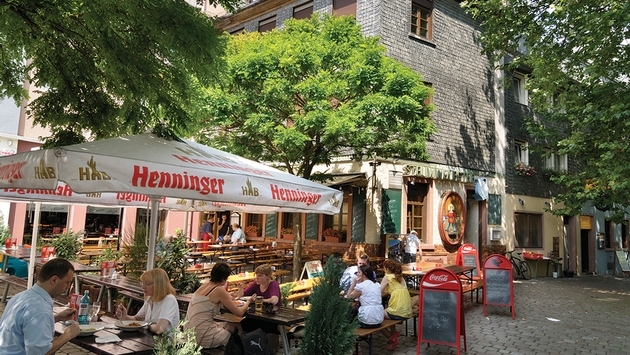 The restaurants in the neighborhood of Sachsenhausen off the south bank of the Main are known as the best places to find two local culinary specialties: apple wine and green sauce. In that part of town, you can tell the traditional apple wine restaurants by signs they have outdoors. When the wine is fresh, there will be a green wreath in front of the Ebbelwoi taverns. Not to be confused with that old Woodstock-era favorite Boones Farm Apple Wine, the Frankfurt variety tastes like a fine hard cider, a cider with a pedigree that dates back to Charlemagne who only recently celebrated his 1,200th birthday. A tour on the Apple Wine Express (www.ebbelwei-express.com) allows passengers to sit and have a glass or two of apple wine, while the streetcar passes by various downtown attractions. A small pot of the local green sauce or Grüne Sosse, a mixture of seven herbs including parsley, dill, chervil, chives and sour cream can be found on the benches in these very traditional restaurants. Goes well on the boiled potatoes that you’ll likely have with the meat you are eating. Frankfurters, like it on just about everything. As the capital of the German state of Hessen, Frankfurt offers great daytrips to Odenwald, Taunus or Vogelsberg as well as such smaller cities as Mainz, Kassel, Darmstadt, Fulda and Wiesbaden. Frankfurt also offers access to such UNESCO sites as Lorsch Benedictine Abbey, the Upper Middle Rhine Valley, the Roman Limes and Messel Fossil Pit. Bad Homburg and Wiesbaden offer spa towns within easy reach of Frankfurt. When Frankfurt Airport (www.fraport.com) added the Pier A-Plus in 2012, Germany’s biggest hub got 6 million passengers in capacity bigger. Now the airport can handle up to 65 million passengers per year. Like Heathrow’s new Terminal 2, Pier A is devoted to Star Alliance carriers. Frankfurt’s Terminal 1, with a total area of about 129,167 square feet, has some 60 shops and restaurants. After the German domestic market, the U.S. is Frankfurt’s top market, followed by Britain, China and Italy. 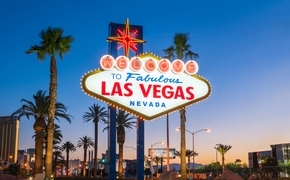 Last year, the city received approximately 3.9 million visitors who spent about 6.4 million nights.